opment the character of Ellery Queen was adapted to radio by its creators, as former advertising writers, knew the promotional power of radio. The authors brought to the new medium the "challenge to the reader" from their earlier books. This said, in essence, "You now have all the clues; can you solve the crime?" On radio, this took the form of the fictional Ellery stopping the action and delivering the challenge in person to the listener at home and, in some incarnations, to a celebrity sleuth there in the studio. The Queen radio show ran in one form or another on CBS, NBC, and ABC. Scripts were by Dannay and Lee, and later by Lee assisted by others, most notably Anthony Boucher. During the 1940's EQ wrote a large number of radio plays. The Adventures of Ellery Queen started on radio in 1939 and lasted until 1948. EQ was apparently the pioneer author to move from prose fiction into the radio drama. Their value has to be seen in comparison with other radio plays. The story format simply isn't up to the depth a novel can reach. What makes them irresistible to a Queen fan is that almost each and everyone of the radio plays recycled "Queen ideas" or contained typical elements which were later re-used in the Queen-novels. The Adventure of the Murdered Moths is collection of the greatest radio plays by Ellery Queen. Frederic Dannay and Manfred B. Lee won an unprecedented 5 Edgars. Columbia program America's Grub Street Speaks, it was the third episode of a new series of, initially, six broadcasts over the Columbia Broadcasting System from 6 to 6:15 p.m. each Sunday. Tom L. Stix brought literary celebrities before the microphone and discussed in an informal manner the subjects and problems which interest them most. This time you could hear three mystery story writers attempt to solve a real mystery. Captain John Ayers head of the New York Police Department's Missing Persons Bureau stated the known facts in a case his department has not been able to solve. Barnaby Ross, Ellery Queen and "The Diplomat" tried to find the answer. 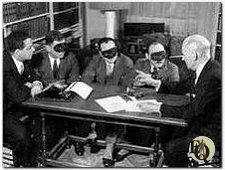 These three all appeared incognito and on the promotional material for this broadcast we see them wearing masks. Lee of course was Barnaby Ross, Dannay was Ellery Queen and "The Diplomat" was John Franklin Carter. Carter was a writer under under several pen names, ("Unofficial Observer","Jay Franklin",...). who in 1930 wrote a series of detective novels about a diplomat-detective, Dennis Tyler under the name "Diplomat". Each writer took one possible approach and worked on that exclusively. As the NYT article puts it "The test will probably not proof anything, but it sought to be amusing". But the resultant theories were so very intriguing, and the idea was such a success that Stix was encouraged to repeat it. Some weeks later "Diplomat" was called to Washington to attend to affairs of state, and Edwin Balmer, editor of The Red Book, took his place. (When Last Seen, Sat. Jan 14, 1933 WABC 6:00-6:15 pm). Mr. Balmer was formerly a police reporter in Chicago, and has several real murder solutions to his credit, besides a number of detective stories, so he made a formidable opponent for Messrs. Ross and Queen. It got both Dannay and Lee in the media and this had more to do with there intentions of playing out their Barnaby Ross/Ellery Queen parts (which was mainly about drawing attention to their books) rather than really wanting to get into radio. Above left: GRUB STREET TURNS SLEUTH. Turning from fiction to fact, three writers of mystery stories, known under the 'nom de plume' as Ellery Queen, Barnaby Ross and "The Diplomat", applied their wits to the solution of a real unresolved mystery as presented by Captain John Ayers, head of the NYPD's missing persons bureau, during one of the new series programs known as "America's Grub Street Speaks", presented each Sunday evening over the WABC-Columbia network. Above right: "The Diplomat" was John Franklin Carter. who in 1930 wrote a series of detective novels about a diplomat-detective, Dennis Tyler under the name "Diplomat". n 1938 the cousins were experimenting with different media. Both their efforts in theater and Hollywood had gone astray and fortunately for them an other medium was to come to full bloom... it came looking for them. Ellery Queen was a guest along with Donald Budge, Benny Leonard, James Braddock, ... in For Men Only (NBC 38-05-2) where amid a number of talk an drama subjects guest appeared. The participation was more than likely intended as publicity for their books, their biggest move with regards to effective use of the medium radio was soon to follow. George Zachary, a young executive at CBS was playing with the idea of an hour long detective where the listeners could match their wits with the leading character in solving the riddle before he could. He was searching for the writers who could come up with a weekly script for such a series... At that time radio had his heroes e.g. The Shadow but no "real" detectives. Zachary was not really an expert on detective fiction and started working his way through several libraries. Only after some 200 stories he stumbled upon his first Queen-story. There he found his idea of challenging the listener in print. He made the cousins a modest offer of $25 a week in exchange for which they had to provide an hour long radio mystery on a weekly basis! It's probably wise to deduce that the possibility of millions of listeners did the trick. They were given the chance to learn the skills of this new profession by writing scripts for two existing series, sadly without credit nor pay. One of these was Alias, Jimmy Valentine (1937-1939), remotely based on an O.Henry short story about a reformed safecracker and featuring Bert Lytell in the leading role. The cousins supposedly wrote scripts on a weekly basis. Only one episode is written by them for sure: the episode aired on November 21,1938. Probably their last work for the series. Fred and Manny also appeared in This is New York, (Feb. 26, 1939, 8:00 to 9:00 pm ) a series designed to give listeners a grasp of the real New York through interviews with famous, ordinary and obscure people who live and work there. The episode had the following items: "Ellery Queen" Solves a murder; Julia Sanderson, Ella Fitzgerald, Chick Webb, Deems Taylor. They did appear as Mr. Ellery and Mr. Queen in a half game half panel show called Author! Author! which debuted on April 7, 1939. This show, they created and sold to the Mutual Network, would start with a dramatized version of some inexplicable event and the moderator (first Ogden Nash, later replaced by S.J.Perelman) would then challenge each of the four panelists to come up with a solution which would make sense. Next to the cousins several media figures served as guests Dorothy Parker, Fannie Hurst, Heywood Broun, Moss Hart and George S.Kaufman, Marc and Carl Van Doren, Erskine Caldwell, and Quentin Reynolds to name but a few. After having put their solutions to each other it was attacked by the other members of the panel and listeners could participate to by sending in their solution to the problem. The sponsor B.F. Goodrich Rubber Co. offered $25 for every solution that was aired. An example employed on the first program was this: "A young man arrives for the reading of his uncle's will. The only heir is in desperately in need for money to cover his gambling debts. The will gives him a choice: Accept $10,000 in cash or the contents of an envelope. He opens the envelope, which is empty, with no stamps or writing on it. 'I will take the envelope,' he says." The solution which Dannay proposed was that the young man had poisoned his uncle by means of a poison applied to the envelope and that this uncle, before dying, gave him the choice of destroying the evidence of his crime or to claim the money, for which he committed the crime, only to risk exposure. Panelists were supposed to devise this kind of solution on the spot, while being attacked by other panelists. This kind of mechanical approach was especially appealing to Dannay and despite being a daring format for that period it wasn't what audiences waited for and it was a surprise it lasted for one year. Lee had stepped up to the challenge to provide a weekly Ellery Queen script for which they earned $350/script. Not without hiccups. At the advice of his lawyer Walter Rosemont, who had claimed that he got the twosome the assignment of scripting the series, settled his contract with Lee and Dannay for $1,100 (he sued them for $20,000 in commissions, while Lee and Dannay also brought an action, seeking the court's approval for breaking of their contract). Ellery Queen was to be portrayed on the air by Hugh Marlowe, and his contract specifically stated that he was not allowed to appear on any other programs. Also in an attempt to attract a more female audience, Dannay, Lee and Zachary added a new character to the stories: Ellery's secretary Nikki Porter. Auditions were held and Marlowe remembers with a wince he recommended Shirley Booth as his leading lady, but Marion Shockley, whom Zachary married, won the part. The analogue to the 'Challenge of the Reader' was to stop the action and put the crucial question to a panel of well known guest stars or later listeners. Zachary produced and directed thirty-four hour-long radio drama's which were broadcast between June 1939 and February 1940. The program ran initially on a sustaining basis (without a sponsor) as a summer replacement for The Screen Guild Theater. Studio executives were initially not impressed by the program. They changed their view when due to a water hose burst in the transmitter cooling system at a Chicago station WBBM "The Mother Goose Murders" was forced off the air 9 minutes before the end of the program. The number of listeners who called in was so great it not only remained on the air but also garnered its first sponsor Gulf Oil. Not much survived the years apart from the 'translations' of the stories to other formats. After this period the format changed to half an hour drama's. To prevent the plot leaking out Zachary would keep the final part a secret even to the actors who played in it. At the last dressed rehearsal all was revealed and it didn't take long for the actors to organize a pool, the winner being the one who unmasked the culprit. Ted de Corsia (Velie) and runner-up Robert Strauss (Doc Prouty) were the most frequent winners. For its first few months, the show's armchair guests (at $25-$50 a case) were not that frequent winners. 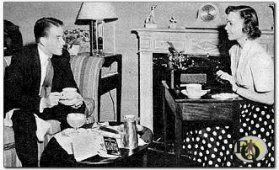 Above left: Hugh Marlowe and Marion Shockley appear before a CBS microphone to promote The Adventures of Ellery Queen. Marion Shockley (Nikki Porter), Robert Strauss (Doc Prouty). Show goes from 60 to 30 minutes. Above: In the script, Ellery is a mystery-story writer who tries his hand at solving crimes, Nikki is his secretary and confidante. 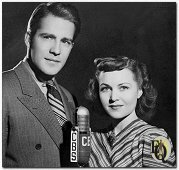 In real life, Ellery (Hugh Marlowe) was born in Philadelphia, educated in Chicago and Madison, Wis., spent four years in Pasadena (Calif.) Playhouse before coming to radio as an announcer at Davenport, Iowa. Nikki (Marion Shockley) was born in Kansas City, started her career in films, went to New York stage, thence to radio. - ED (Picture by Walter Seigal) (from Radio Guide 40-01-05). n 1939, over at CBS, the Columbia Workshop started it's second series. 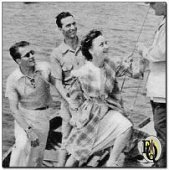 The Workshop was the first to experiment with radio drama, added sound effects and music to good scripts thus attracting many big stars. In the early years Bernard Herrmann (Picture right) scored for the workshop. Herrmann, one of the most innovative composers in radio, would also score the first Ellery Queen radio series. The Ellery Queen cast likes to be heard above the incidental music of the organ, except when guest detectives turn up early, during the dress rehearsal - then, when the crime's solution is given, the organ fairly roars, drowning out all voices. The Columbia Workshop 2nd series had as it's 7th episode "The Great Microphone Mystery" a 30-minute episode broadcast on October 05, 1939. Aka Ellery Queen Mystery "The Case of the Mysterious Leap Year" and reran on February 29, 1940 it featured several CBS personalities, joined by several of their wives, play roles opposite to their usual ones. Burgess Meredith, Beatrice Kay, Howard Barlow, John Reed King, Mel Allen, Earle McGill, Norman Corwin, Nila Mack, Ted Husing, David Ross, Robert Trout, Kitty Trout, Mrs. Linton Wells, Ray Bloch (music director), Phil Cohen (director), John Fitzgerald (director), Paul Phillips (writer), Ted de Corsia, Mrs. George Fielding Eliot and Hugh Marlowe. The nephews wrote at least two 12-minute scripts for The Kate Smith Hour a popular radio show with Kate Smith (singer) and Ted Collins (vice president of Columbia Records). Both of them were armchair detectives in one of the EQ radio shows early on in 1940. The script aired just after their guest appearance. Two scripts "The Case of the Three Macklins" and "The Case of the Crusading Reporter" (dated Jan 12. 1940 or Jan 19. 1940) were recovered and star Ellery, Nikki and the Inspector. One newspaper announced (Jan 12. 1940) that Ellery Queen would make his postponed appearance on The Kate Smith Hour a week from tonight... (Gertrude Lawrence had replaced the EQ capsule on Jan 12.) . We can confirm that Ellery Queen's mysteries, in 12-minute abbreviated form were a part of The Kate Smith hour with Kate acting as the armchair detective. "8:00 P. M. Tonight Kate Smith turns sleuth for a while to match wits with microphone detective Ellery Queen in a capsule "Adventure of Ellery Queen" presentation." (Rochester Times Union, Jan 19.1940) The Jan 19. capsule was in fact "The Case of the Three Macklins". That script has been made available in print through a special Crippen & Landru booklet in 2005 (limited edition of Adventures of the Murdered Moth), it clearly mentions the fact that next week another EQ-story would be heard. In all likelihood only one script made it to the air. Copyright © MCMXCIX-MMXVIII Ellery Queen, a website on deduction. All rights reserved.